In many parts of the world, when the snow falls it means that you have stop fishing and wait until spring to finally start angling again. But in Sweden, not even a meter-thick snow can stop passionate fishers from practicing their hobby. 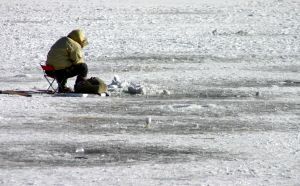 Ice fishing is more or less a tradition in Sweden, because in the in the past people did it to earn a living, but nowadays it is something that people do for fun.